Swire Properties President Stephen Owens told a forum last week that ‘there’s no question’ that sales of condos at Brickell City Centre have slowed down. Owens told the audience that the market is ‘at half the pace’ compared to last year. He blamed it on more discerning buyers, and said that it was a sign of a healthy market. His comments were reported by The Real Deal. 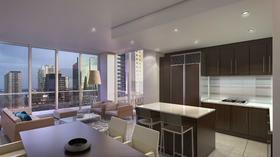 As of March, 17% of units at Swire’s Brickell City Centre RISE condo tower has been sold. That compares to nearly 80% sold at REACH, which launched sales earlier. Dezer Development president Gil Dezer echoed Owens’ sentiments last week, saying that ‘there’s the same number of buyers’ as before, but more projects. He also said that it was now a healthier market, and that it wasn’t ‘normal or stable’ when units were selling out as fast as they were last year. via Swire Chief: Condo Market ‘At Half The Pace’ Compared To Last Year, But Healthy. 23,500 condominiums — 5,300 apartments — 6,000 hotel rooms — 3.5 million sq. ft. of office space — 4.0 Million sq. ft. of retail…..All within the Greater Downtown Miami area…. Click on the link to see where they plan to put all that “stuff”. Greater Downtown Miami Development Pipeline. Swire Properties plans an 80-story, mixed-use tower at the 700 Brickell Ave. site it purchased recently for $64 million. The Arquitectonica-designed high-rise would serve as the entrance to the Brickell CityCentre project currently under construction on both sides of Miami Avenue, immediately west of the 700 Brickell site. The tower, to be called One Brickell CityCentre, will include retail, Class A offices, condominium units, and a hotel with a restaurant and lounge, according to a statement released Friday. The plan also envisions grand plazas and retail shops connected to Brickell City Centre. Upon its completion in 2015, Brickell CityCentre will comprise a luxury shopping center, two residential towers, the EAST Miami hotel by Swire Hotels, serviced apartments, a wellness center and Class A offices. Swire Properties intends to work with the city of Miami to have One Brickell CityCentre approved as an extension of the existing Special Area Plan. The site is currently home to Northern Trust Bank, which had an interest in the sale of the property. Owens told the Business Journal in August that Swire may hold off on developing the siteuntil after the Brickell CityCentre project is complete. Related’s Element to have three towers, 1,000 condos – slideshow – South Florida Business Journal. (c) a giant new front door with the aforementioned Brickell Avenue address. They paid a pretty penny for it too, beating out Related Group and Fortune International who were also bidding for it, to the tune of $65 million. And which property did they buy? The site was marketed on behalf of Northern Trust and the Brickell family trust, which share control of the site, according to sources who asked not to be named. And was most recently the home of Miami Today. 1400 Biscayne is being revived from the original building that was proposed for this site before the economic crash. 1400 Biscayne is mixed-use, although primarily residential. It is designed by the architects Pei Cobb Freed Partners. The building would rise 651 feet or 198 meters, towering over theArsht Center, located just a block south of this project. The building is designed with a ground floor courtyard with retail, perfect for cafés and restaurants for the theater crowd. Above this would be about 100,000 square feet of office space and 710,000 square feet of residential space, totaling 428 residential units. The previous design for 1400 Biscayne was more airy, incorporating a lot more glass than the current, heavy design does. 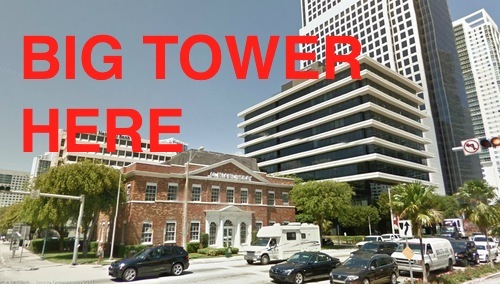 Currently on the site is a dull, three-story office building from 1971, which would be demolished to build this tower. The area around the Arsht Center is desolate with vacant lots surrounding every corner of the performing arts center. After a show, most patrons leave the area for other neighborhoods for dinner and drinks. 1400 Biscayne could be the catalyst for infill development around the beautiful performing arts center to finally create a 24/7 urban neighborhood here. The original design for 1400 Biscayne. The Adrienne Arsht Center can be seen to the right of the tower. Ground floor view of the new design for 1400 Biscayne. Aerial view of the new design of 1400 Biscayne. Designed by architect Enrique Norten, Brickell Flatiron was initially proposed to much fanfare in 2006 as one of Miami’s most exciting high-rise designs. Unfortunately, construction never began and the lot became a parking lot. In 2011, the lot’s southern corner was the proposed site of a small pocket park designed by Raymond Jungles. Work began on the park in 2012 but as of October 2012, work has been stalled for months. Now, the high-rise is back and the developer is in the permitting process with the city to get this built. Scrap the park idea. Brickell Flatiron is located at 1015 South Miami Avenue, on a triangular lot. The design of the building takes advantage of this unique lot shape with a design reminiscent of Manhattan’s Flatiron Building. 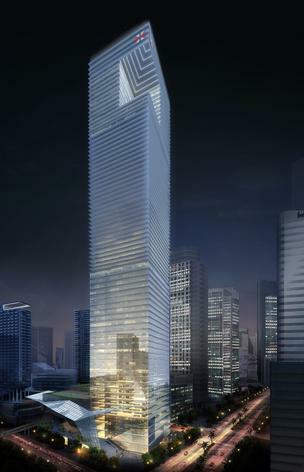 Brickell Flatiron will be 794 feet (242 meters) tall with 70 stories. Inside will be 554 residential units with 254,043 square feet of office space, 30,316 sf of retail, 16,913 sf of restaurant space and 820 parking spaces. Brickell Flatiron building as seen from South Miami Avenue looking north. Brickell Flatiron as seen from SE 10th Street looking south. The triangular lot’s southern tip will become a public plaza. The developer is currently going through a land swap with the city to transfer the lot’s southern tip to the city for public use. In exchange, Brickell Flatiron would get the tiny pocket park on the northeast corner of this block to develop. Crimson Tower is a 205 foot (65 meters) high, 18-story, 83-unit apartment building proposed for theEdgewater neighborhood at 527 NE 27th Street. Crimson Tower is designed by the architecture firm IDEA. The building is great in that it’ll provide greater population density in the growing Edgewater neighborhood, especially considering it will be built over a currently-vacant lot, however, the design is horrid. Of all the new proposed towers in Miami, this is the least favorite and most aesthetically painful. With 150 parking spaces, there’s also way too much parking for an 83-unit apartment building. The city should discourage developers to include so much parking, especially in a neighborhood as walkable as Edgewater. Just looking at the elevations of this building and it’s clearly half parking, half apartments. Especially for a waterfront location, the city’s planning and zoning department should be more stringent on design standards. This is Miami, the city deserves quality urban design. Very unfortunate. In total, Crimson Tower will be 219,350 square feet, half of which is dedicated to parking. 83 apartments, 6,654 sf of open and green space, 150 parking spaces and 7 bicycle racks. Element was originally proposed in 2006 and was later cancelled. Originally designed by Chad Oppenheim, the same Miami architect who designed Ten Museum Park in Miami’s Park West neighborhood, Element has been revived with a new design by Dorsky+Yue. Element is to be 412 feet (126 meters) high with 389 apartments in 36 floors. Element’s new redesign is beautiful with a public baywalk. Unlike other projects, such as Icon Bay that pretend to open the bay up to the public, Element’s baywalk is much more successful. The old design for Element as designed by Miami architect Chad Oppenheim in 2006. The new and current designed for Element. Oh, Miami World Center. After Brickell CitiCentre, this is one of the most exciting and promising projects for Miami. It’s scale is massive, its urban and economic impact is incredible and its design is amazing. 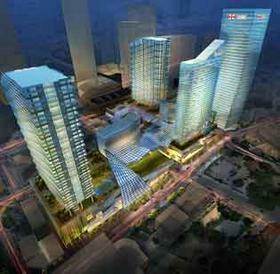 Miami World Center was first proposed in 2007 and then it died down during the Great Recession. Now, with recent land purchases and activity it seems Miami World Center and it couldn’t be more exciting. Miami World Center would take over eight, mostly vacant city blocks in the heart of the city and convert them into a dense, busy neighborhood with thousands of apartments, offices, stores, restaurants, theaters, etc. It’s the kind of development that any city could dream of. Everything is still very abstract and preliminary about Miami World Center, so nothing is exact quite yet. Depending on the aggressiveness of the developer, a project of this scale would no doubt, easily take many years to complete. Worldcircle: The central public plaza of the project. It would feature an impressive fountain and sculpture. Business and retail activity would center around this public plaza. First Avenue: Lush shade trees would line First Avenue with stores, restaurants and cafés on the ground floor of hotels and high-rise apartment buildings. Seventh Street Promenade: Seventh Street would be a pedestrian-only promenade connecting the American Airlines Arena to the east with the Historic Overtown/Lyric Theatre Metrorail station to the west. Seventh Street would have cafés and restaurants on the ground floor with apartments above. Think South Beach’s Lincoln Road, but with much more density. Worldwalk and Worldplaza: A diagonal road connecting Bayfront Park to Miami World Center. This area would have wide, open public spaces with lush shade trees. Worldsquare: This would be a massive semi-interior public space forming a courtyard space within one of the buildings. This space would be covered with a trellis-style roof canopy connecting five stories of retail on either side. This space is billed as ideal for Miami Fashion Week. Miami World Center looking east towards Biscayne Bay. MWC looking north towards Edgewater and Wynwood. MWC Worldcircle would be the center of the retail and business activity in the new neighborhood. MWC Seventh Street Promenade. Seventh Street would be a pedestrian-only promenade connecting the Overtown Metrorail station to the west to the American Airlines Arena to the east. Urban and pedestrian-friendly streets of Miami World Center. Miami World Center’s Worldplaza would be the perfect location for Miami Fashion Week. A rendition of the interior for the 42-story, 382-unit 1100 Millecento Residences,which is planned for a site at 1100 S. Miami Ave. If The Related Group builds its second new condominium in Miami’s Brickell neighborhood, 1100 Millecento Residences will add 382 units to the market. That would be nearly double the size of the 192-unit MyBrickell, another condo it will begin building in the same neighborhood in the coming days. The 42-story 1100 Millecento Residences is planned for a site at 1100 S. Miami Ave. The architecture is inspired by internationally known architect Carlos Ott, who designed the Jade Beach, Jade Ocean and Artech buildings. The interiors are being done by Italian design firm Pininfarina , which has worked with international brands includingFerrari . This marks the first time the brand has applied its designs to a residential building, Related said. As work crews continue testing and prepping the site in Miami where Swire Properties is planning Brickell CitiCentre, the developer announced it has received a $140 million credit facility to fund operations and the initial development cost. HSBC Bank USA is providing the credit facility, which Swire said would allow the developer to do more design, development and cover the initial construction costs, according to a statement released Tuesday. The six-building project is planned for 9.1 acres between Brickell Avenue and South Miami Avenue, from Southeast Sixth Street to Southwest Eighth Street. Located in the center of Miami’s financial district, Brickell CitiCentre will include 520,000 square feet of shopping and dining, three office buildings, two residential towers and a 243-room hotel with 93 apartments. The project will be developed in two phases, with all elements of the ﬁrst phase, except for one office tower, scheduled for completion in 2015. The first phase will have about 4.3 million square feet, including 520,000 square feet of retail shops, 800 condominium units, 243 hotel rooms, 93 serviced apartments, two office towers of 110,000 square feet each and 3,100 parking spaces. A Feb. 15 news release said the third office tower would be completed by 2018, but the Tuesday release said market conditions would determine when the 750,000-square-foot structure would be built. Swire Properties is the U.S. subsidiary of the Hong Kong-based Swire Properties Ltd. In September, the Business Journal reported that the developer planned to dedicate 95,000 square feet of the project to medical offices and a wellness center. (Reuters) – Newly listed developer Swire Properties Ltd said on Thursday that it plans to build a 2.9 million square foot project in Miami’s financial district. The Hong Kong-based company had previously said in a filing that the development, Brickell CitiCentre, would cost about $1.05 billion. It said the project would include three office towers, two residential blocks, 500,000 square feet of shopping and dining space, and a hotel, with construction expected to start in the second quarter. Swire (1972.HK) bought four plots of land for project in 2008 and 2011, and through to September 2011 had spent $72.8 million on advance preparation of the site, including $69.4 million for the land. Although Swire focuses on the core markets of China and Hong Kong, it has a 30-year track record in Miami, where it has been developing on an island called Brickell Key. It has hired Miami-based architects Arquitectonica to design the project. Chairman Christopher Pratt said when Swire Properties listed in mid-January that the company had no immediate plans to raise capital, with the sale of its Festival Walk asset in Hong Kong providing adequate capital for its immediate plans . One fund manager, who runs a $5 billion portfolio of actively managed property stocks in Asia, told Reuters this week that he expected Swire Properties to go to the equity or debt markets soon to fund expansion. “Probably one year from now, they’ll raise money,” he said, declining to be identified as he was not authorised to talk to the media. Swire Properties shares pared earlier losses on Thursday afternoon to trade down 0.8 percent compared with a 0.6 percent decline on the benchmark Hang Seng Index .HSI. Miami CitiCentre’s Solution to Urban Parking….Innovative! With its massive Brickell CitiCentre project, Hong Kong-based Swire Properties is bringing a different twist to downtown Miami development — underground parking — that also will involve a first for the city: groundwater freezing, a project official told Miami Today. “It’s never been done in Miami,” said Steve Krysowaty, president of CBP Construction Consultants in Miami. Currently, preparatory work is being done for the freezing around the perimeter of the site, he said. Using rods or tubes containing super-cold liquid nitrogen, groundwater freezing is needed while building a barrier to prevent more groundwater from entering the site. Eventually, the water will be defrosted and sucked out of the ground to make way for the complex’s foundation and two levels of underground parking, he said. Overall, plans call for a six-story shopping mall, two office towers, two condominium towers, a large hotel, and plethora of amenities such as restaurants, nightclubs, a movie theater and a bowling alley. Construction is expected to start before the end of the year with completion hopefully sometime in 2015, Mr. Krysowaty said. Project officials at Swire’s Miami office did not return calls for comment. Until now, developers have avoided going underground for parking in Miami because of the extensive groundwater here. Likewise, groundwater is spread throughout the CitiCentre site, Mr. Krysowaty said, adding that the complex’s foundation will be anchored to bedrock some 50 feet or so below the surface. The underground parking is necessary because Swire wants CitiCentre to be a “street level” development immediately accessible to both residents and visitors on the ground, according to people familiar with the project. That’s a unique feature in Miami, where large developments typically have multi-level parking garages on the bottom floors, with the featured development on top. In addition, pile testing has been done on the site to determine the ground’s capability in various spots to support the weight of the structures, Mr. Krysowaty said. The CitiCentre site involved in the freezing is divided by Miami Avenue and located primarily along Southeast Eighth and Seventh streets. The parcels are boxed in on the west by Southwest First Avenue and go just east of the Eighth Street Metromover Station.